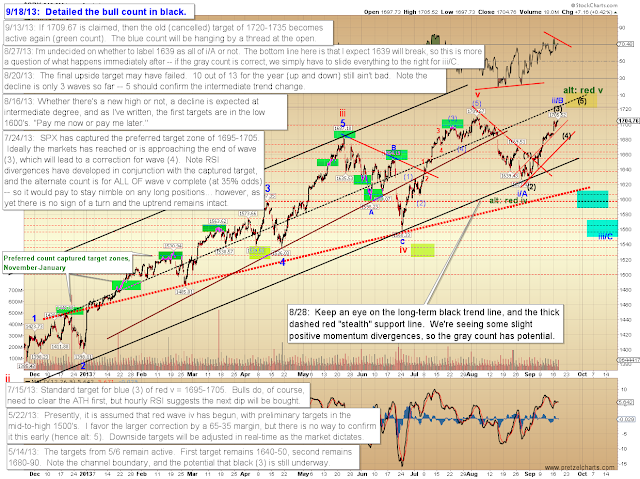 At times like this, it's easy to get lost in the day-to-day market nuttiness, and I've found it's sometimes helpful to take a step back away from the one-minute charts and look at the big picture. So today we'll start off with the old reliable NYSE Composite (NYA). NYA is a great representation of the broad market, since it contains all the common stocks on the New York Stock Exchange -- and it often tells a different story than the big-cap indices like the Dow Jones (INDU) and S&P 500 (SPX). It's very interesting to note that NYA has still not made a new all-time-high. 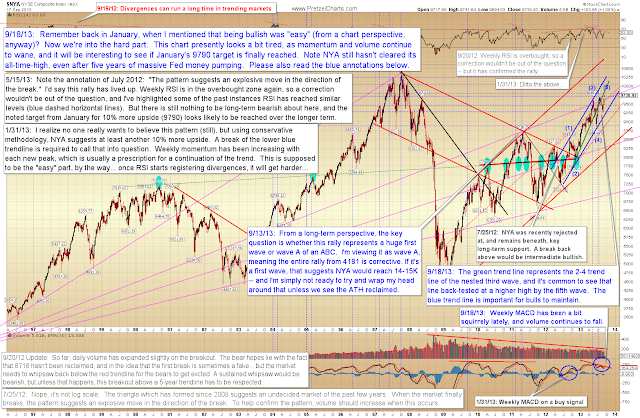 The chart below is a weekly chart, and the notes contain most of my thoughts. Just glancing at the chart, the main thing that jumps out is how quickly and effortlessly NYA plummeted back in 2008, versus how it has seemingly struggled to regain that ground. 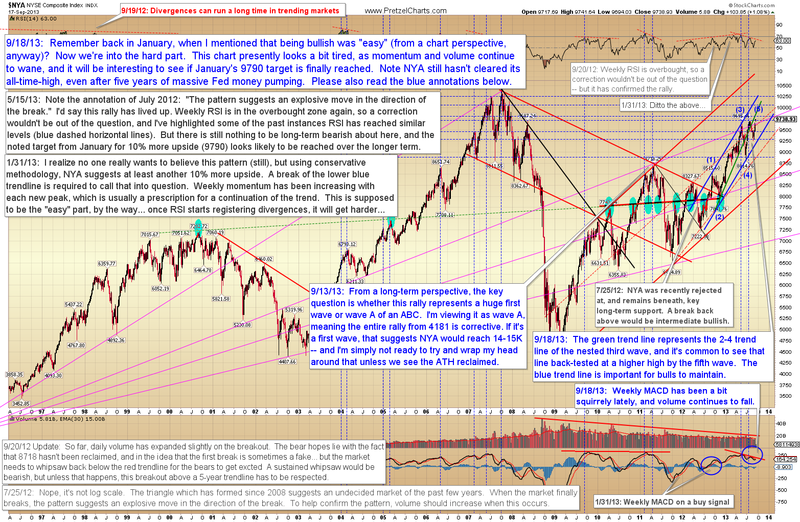 This is especially noteworthy given the massive Fed money pumping that's occurred during the past five years. 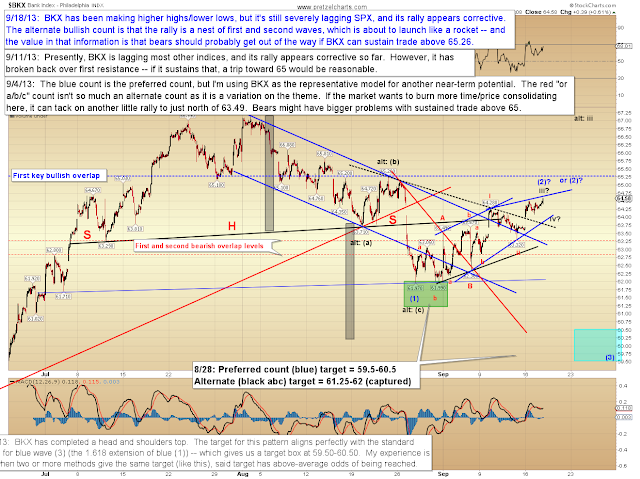 The picture suggests that the fits-and-starts nature of the rally is caused by the fact that it's a correction to the last decline -- one of the ideas behind Elliott Wave analysis is that the market struggles when moving against the larger trend. The Philadelphia Bank Index continues to lag. So far, this isn't doing much to sell me on this rally as anything that will have legs for SPX. Even if this rally is going to become an impulse and make a new all-time-high, it looks like it's very close to being a complete structure. As I've noted previously, the main bullish hopes would lie in the idea that when this five-wave fractal completes, it will make up wave (i) of a still larger five-wave fractal. 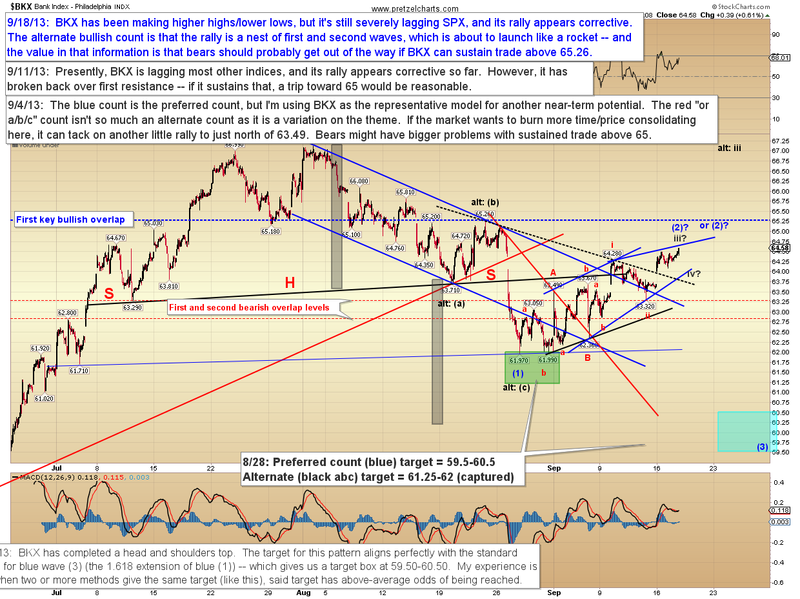 Given NYA and BKX, I currently have to view that bullish option as lower probability. In conclusion, I do not presently believe this is the start of a nosebleed rally -- to the contrary (while I think it's entirely possible SPX will push on to another high), I still believe the market is in a topping phase. Trade safe.